Six people including three children were taken to hospital and two homes destroyed after a suspected gas blast started a house fire. Shaun Coughlan said the blaze broke out in the cupboard under the stairs in his terraced house in Lilac Avenue in Milnrow, Rochdale, on Tuesday evening. He said it spread at "frightening" speed but he "managed to get the kids out before it engulfed the... house". Fifty firefighters tackled it at its height. No one was seriously injured. Image caption Shaun Coughlan said he "just managed to get the kids out before it engulfed the whole house"
Mr Coughlan said: "Me and my partner were sitting in the living room watching TV and we could smell burning plastic." He said he went into the kitchen and the top of the cupboard door was black. "I opened the cupboard door and the whole cupboard was just engulfed in flames." He said it was "frightening how quickly the fire escalated". He said one minute it was a small cupboard fire and within four minutes the entire hallway was alight and flames were coming out of the front door. Lisa Lack lives nearby and she said she ran round the corner to see her father outside his home with thick black smoke coming out of it. Her father Carl Lack lives next door to where the fire started. Ms Lack said: "My dad is devastated. He's got nothing left. "His whole house has gone." All six people were taken to hospital for the effects of breathing in smoke. Greater Manchester Fire and Rescue Service said crews had worked through the night to control the fire. 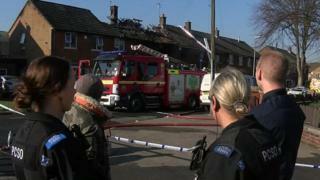 It added an investigation will begin in due course into the cause of the fire but said it was a suspected gas explosion.